Back in July we wrote about an exciting project aiming to make computing accessible to school students in South Africa, where most schools have no computers at all and many lack electricity. 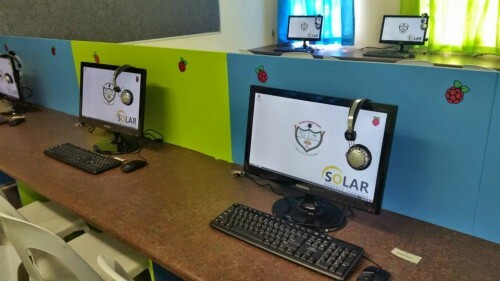 Solar Powered Learning was raising funds for a Raspberry Pi computer lab at a secondary school in Johannesburg, with the aim of creating a facility that can be reproduced all over South Africa, and powered by solar energy where mains electricity isn’t available. 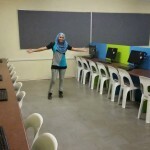 Their Indiegogo campaign was successful; we donated a classroom set of Pis and accessories, and project manager Taskeen Adam and fellow organisers set about coordinating volunteers to sand, drill, paint, lay cables, build desks and fit curtains. Remarkably, less than one month after the close of the fundraising campaign, the new computer lab was ready to use. The team really did a stellar job meeting such a tight deadline. I was especially charmed by the school choir opening the ceremony, a student’s poem extolling the potential of technology and the many hand written thank you letters from students. 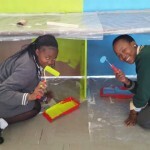 It was very clear that the school, teachers and learners are very excited and appreciative of the project. The Lab itself utilises a Linux Terminal Server Project (LTSP) with the Raspberry Pis working as thin clients. The server is additionally loaded with Khan Academy Lite (adapted to the local curriculum). This lets the students have a capable desktop experience and access to teaching videos and interactive exercises. Worth mentioning are the key local partners Siyafunda CTC, PiFactory and Ismail Akhalwaya, who have done a similar setup previously at another local township school and were key in getting this project completed. ​This first pilot does not include solar panels and they were able to use a school which has an existing electrical connection. 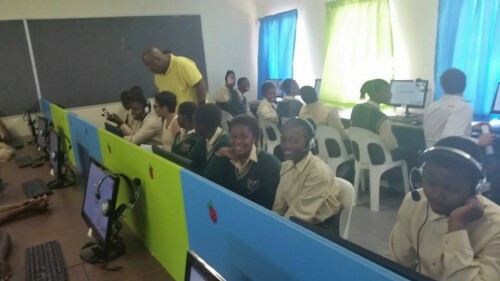 Hopefully, in the coming months we’ll be able to see the success of the model, and we hope to see it expand across South Africa where many schools lack both computer labs and valuable computer skills. 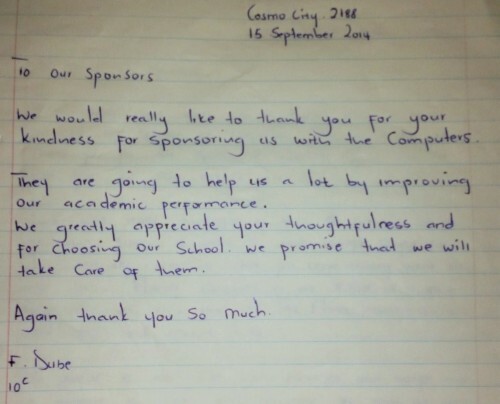 Several of the students have written letters of thanks to sponsors of the project – it’s clear the school community is really excited about the opportunities their new computer lab offers. It’s been great to watch the project develop this far, and we’re looking forward to more! The point I like is, this isn’t a hodge podge of second hand kit beng charitably recycled, but cutting edge kit with hopefully a low ongoing cost. There’s no reason why such a network couldn’t support any small enterprises and these students will know how to do it.. Thank you all the backers out there! Epson has a low-operating cost family of inkjets, the “EcoTank” series. Ink is refilled in bulk liquid form from bottles. (Not marketed in U.S. at this time, though). How about a pedal powered line printer. The ink and ribbon are eminently maintainable, the actual positioning of the strike pins is very low power, and the actuation of the striking shuttle can be wind up or pedal powered if insufficient power isn’t available to run the shuttle directly. Only provides low to medium resolution strike printing, but how long did America survive on greenbar and line printers? The truth is that one seldom needs printers anymore. This generation can assimilate information straight from the screen. Unlike us who had to print something before we could read and internalise it. Agree, for interactive tasks. But for one-way assimilation (reading stories, news, etc. ), hardcopy printouts can be useful if screen time is limited, or if you’re untethered from away from any tech devices (at home, on bus or train, etc.). I like the idea. An alternative that I occasionally wish for is a decent plotter that can use a cheap pen or pencil. I imagine it would also have limited resolution, as well as speed, but both ink and paper would be extremely cheap. Have you seen this website. It uses a Raspberry Pi powered plotter/drawing robot to do pictures from photos but it looks as it could be converted to your needs. the project is called Blackstripes. Hope it helps. The school is in Johannesburg, not in a remote area so access to all supplies, consumables or whatever else are readily available. Cost is the issue. Tell us how we can get involved and what we can do to assist. Thanks for the positive feedback everyone :-) It definitely wasn’t an easy task and we are still stuggling to get things running smoothly. The most important part is not getting the technology out there but get it used optimally. This involves training the teachers and the learners about HOW to use the facility. Knowledge transfer is often a greater task than providing resources. As for the printers: I think printers would definitely help in adding a sustainability aspect to the lab (generating some revenue that could be used for maintenance). We didn’t actually add a printer at this school as they already had one provided by the department of education (no point duplicating resources). I would say it is a definite must in a school that doesn’t have any such a resource. What Very happy time I’ve had reading about your extremely interesting machine!! AND, your sharing of it with those good people in South Africa was such very loving thing to be done with those really needed it and appreciated it. May you all prosper and enjoy the best of health!! I shall wait to read more about your “magic” machine with the delicious name. And the Terminal Server+Thin Client architecture could interest every classroom around the world. I hope that there are similar project in Europe! I’m french and i’m being part of a non governmental organization that helps a technical school located in a favela, in northeast brazil. 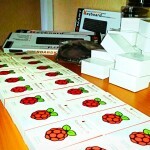 We had the same idea not only to create such a lab in the school itself but also to help student doing their own raspberry pi computer for home. We would like to have contact with this South Africa school in order to have explanations on some technical issues. Could it be possible ? It happened – and I am also cutting my teeth on this new device – glad it happened in SA. Does this only live in JHB area or does other parts of the country also get exposed. I am not in SA now still working in Tanzania but can assist with school names and contacts if required.